Once again, the still life that had been set up in the studio was absolutely beautiful. It made me feel relaxed and at peace. I had a strong urge to disappear into a forest or somewhere where I'd be surrounded by nature. Of the lovely essential oils that we smelled, Clove, Lavender, Sandalwood, Rose, Cedar Wood, Peppermint, Basil, Geranium and Pine, Peppermint was my favourite. 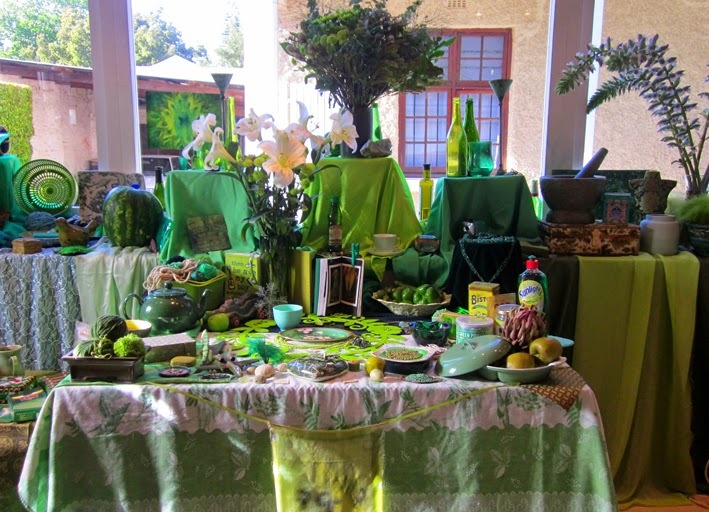 We sat quietly around the still life soaking in the colour green. 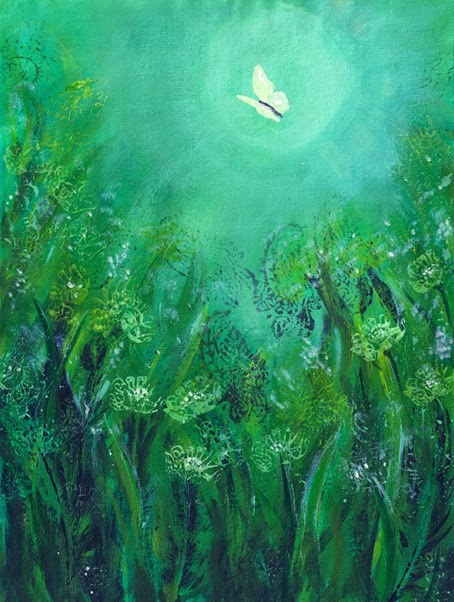 After a short meditation, we mixed up our paints in six different tones and shades of green and began to paint. I applied a base coat to my canvas paper and then found myself painting many wavy lines in various shades and tones. They soon began to look like blades of grass. I painted a circular shape in a lighter green, almost like a sun. The blades of grass seemed to all reach up to it. I grabbed a couple of the wooden printing blocks that I love. One of them looked a bit like a flower, so I started stamping flowers onto the page. I felt like I was lying in a field of flowers looking up at the sky. In my mind a white butterfly fluttered by. So I painted it in. 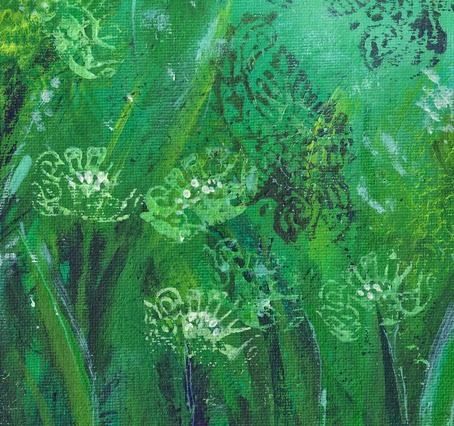 My painting of the colour green. Detail added with the wooden printing blocks that I love so much. At first I wasn't sure how my painting related to the Heart Chakra at all. Was it the butterflies in your tummy when you fall in love? Flowers given as a romantic gesture? It seemed a bit silly. So I took time to read up about the Heart Chakra and the symbolic meaning of butterflies. A butterfly is most often associated with symbolism of change and powerful transformations. Elevation from earthly matters, turning into emotional or spiritual. In many cultures the butterfly is a symbol of the soul or soul world. For the Japanese, a white butterfly symbolises the soul of the departed ones. In Greek mythology, Psyche (meaning "soul") was often depicted as a butterfly winged goddess. She was linked with love as she shared an endlessly passionate bond with Eros, the god of love. Green is the colour associated with the fourth Chakra, the Heart Chakra, also known as Anahata. It is located in the heart and chest area. The purpose of the Heart Chakra is to give love, to receive love and to find balance. It deals with issues of self-love, relationships, intimacy and devotion. This fourth Chakra is also the middle point of the seven chakra system. It acts as a bridge between the lower three Chakras which deal with the physical world (earthly matters), and the higher three chakras which are to do with expression and spirituality (soul).